Did you ever have a food that spoke to your soul? A food so good, that you can remember exactly where you were when you tried it for the first time? It was Thanksgiving day in the year 2000. My parents came down to visit and since it was just the three of us, we went out for a gourmet Thanksgiving dinner at one of those fancy restaurants. It was there that I met pumpkin bisque for the first time. I am excited to share my gluten free and vegan version with you! Where oh where have you been all of my life? Anyhoo… I was on a mission to make this savory treat myself. Now, I need to take you back in time 16 years. I was single, and a bowl of cereal was considered dinner. I didn’t cook. And the internet was still fairly new (and NO Pinterest GASP! ), so I searched through cookbooks (remember those!!!) to find a recipe. The problem was, all of the recipes required… cooking. As in… actual labor intensive, lots of weird ingredients kind of cooking. Which even to this day, I don’t participate in labor-intensive cooking. Who has time for that? And I still don’t know what a shallot is. Why are you putting it in my soup? 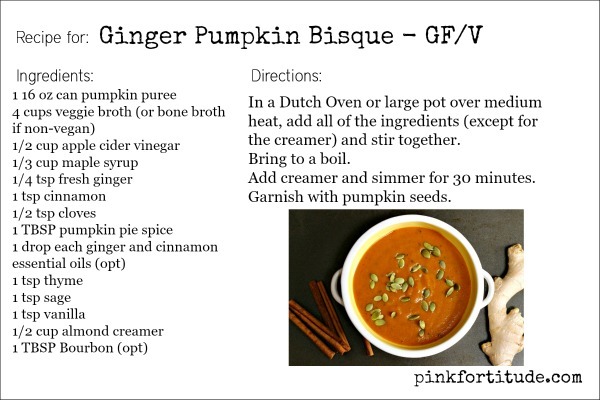 Needless to say, over the years, I perfected my own mouth-watering, bowl-licking recipe for Ginger Pumpkin Bisque. The only problem… my failing health required me to make some serious nutrition alterations. I needed to recreate a gluten free and vegan version. 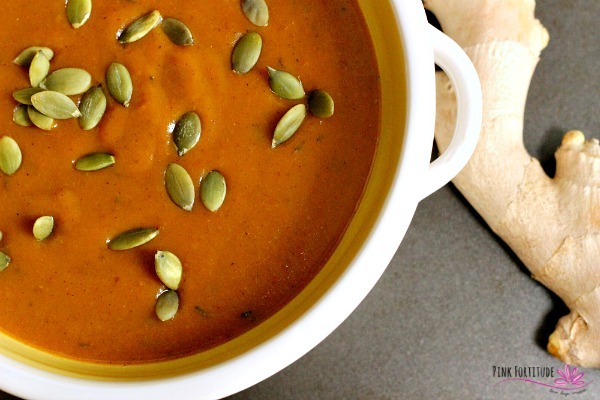 What I like best about this soup (other than my slight obsession with all things pumpkin) is that the flavor hits so many different notes. The cloves are deep and full. The maple syrup and cinnamon and fresh ginger give it that perfect balance. The apple cider vinegar is light and refreshing to top it off. I used as many organic ingredients as I had on hand. There are a lot of ingredients in this recipe, but they are mostly ones you already should have on hand. And none of this fancy schmancy cooking – dump it in a large pot or Dutch Oven and let it go. I also like to add a drop of Cinnamon and Ginger Essential Oils. They are both very potent oils, so one tiny drop of each will create additional depth of flavor. Click on the recipe card to open a new page for a printable version of the recipe. 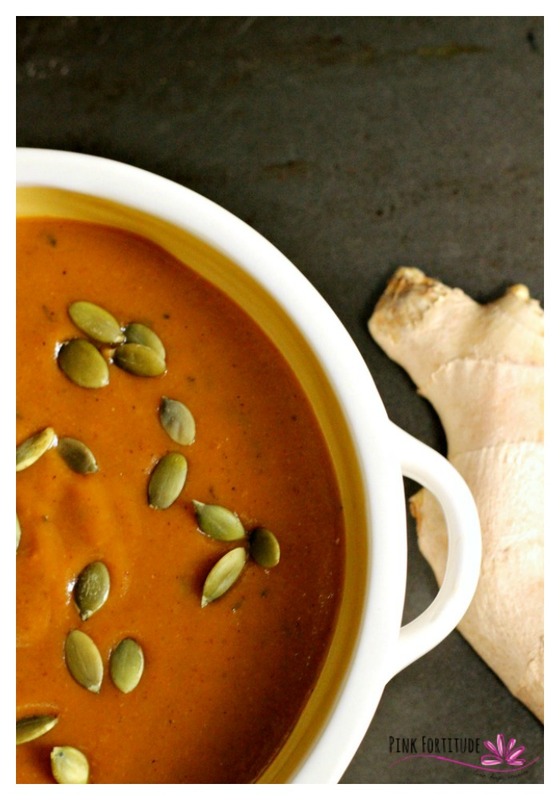 As you can tell, I’m over the moon excited to share my Ginger Pumpkin Bisque with you. I hope you enjoy it as much as I do! Love, hugs, and loving the healthier version! 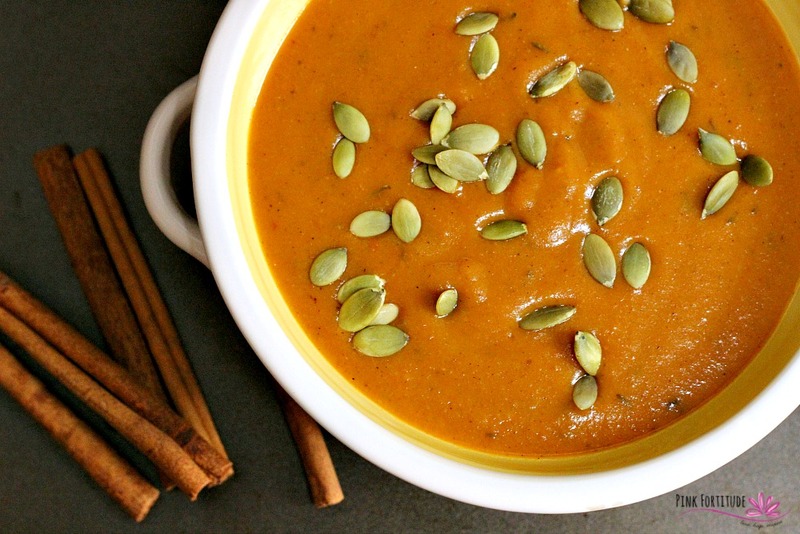 I love fall for many reasons and one of them is soup! 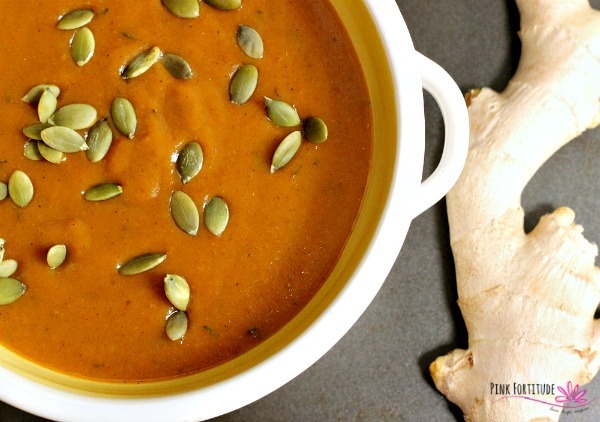 This bisque sounds delicious and I love all of the spices and flavors that it has. I know this will be on my menu soon! I’m working on putting together a pumpkin round up right now and will definitely be including this! I just pinned this really flavorful looking recipe. I love ginger. Thanks for sharing! I also like to make homemade ginger tea by finely dicing some fresh ginger root, putting it in a tea infuser, steeping it in hot water, and then adding honey. I just love ginger. Two of my absolute favorite fall flavors. This sounds incredible! 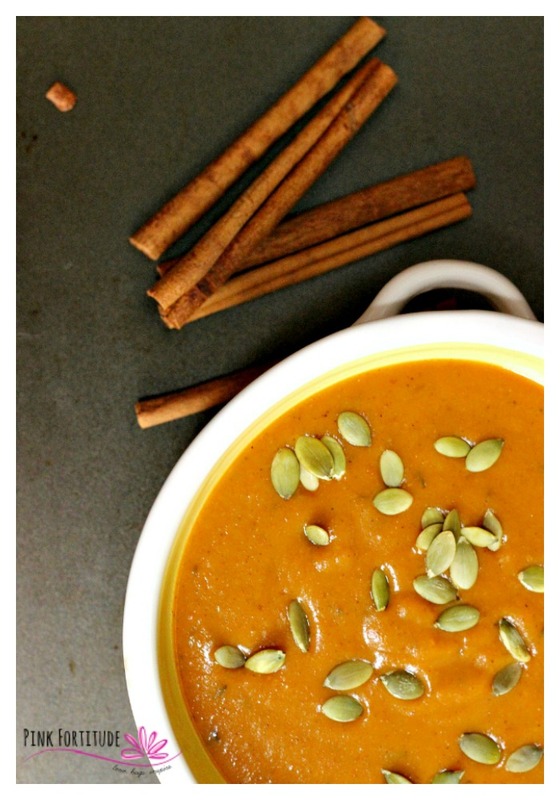 I tend to only like pumpkin in sweet dishes (muffins, pie), but you’ve convinced me that I have to try your bisque. 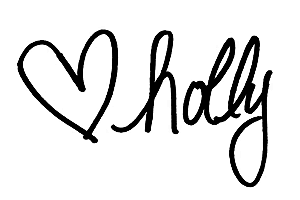 Hi, Holly! This looks healthy, delicious, and so FULL of flavor! Perfect for fall. 🙂 Pinned and tweeted! sounds delish and totally yummy! looks pretty too! Thanks for sharing with us! Yum! 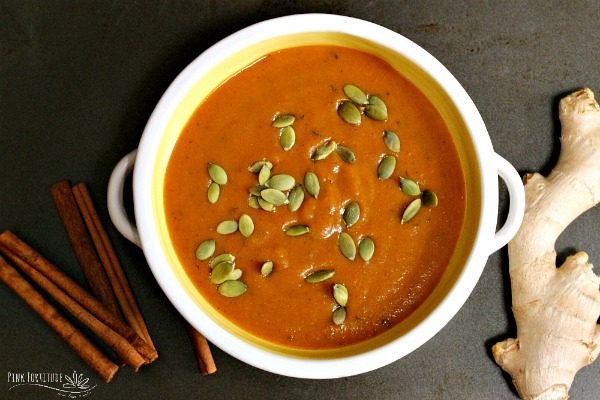 Seriously, sweet soups are one of my favorites!! I pinned from the ultimate pinfest and am going to try this soon! Thanks, Holly! Would you consider sharing this at our weekly Dishing It & Digging It Link Party? We are live every Sunday @ 4pm. We’d love to see all your creative recipes and projects.